Today was a quickie to get checked out on North Texas Aero’s new DA-20! I went with an instructor to learn all about this fun little aircraft. 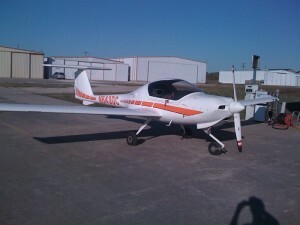 It’s larger than the SportStar, but smaller and faster than the Cessna 172. It also has a center stick like the SportStar, but was much easier to fly. It has a few quirks in the mechanics of how it flies, but nothing that was not easy to conquer. We did the standard maneuvers, including slow flight, steep turns, stalls, and engine out procedures. I made my field quite nicely, though traffic made us cheat a little bit. We had to continue past where the instructor wanted to do the engine out, and wouldn’t you know he had me set up on a HUGE green field. It’s not uncommon to find farmland, but it is uncommon to find such a large patch without any obstructions. Then it came time to practice landings. There was a 10kt, 20° crosswind component gusting to 19kts. Now, those of you that have flown with me know that I do well in high wind situations. Today was no different. SMOOTH AS GLASS BABY! I promise you, if it was calm air I would have botched them for sure. Odd quirk about my piloting skills. Anyway, did a few of those, dodged all of the 172s pulling banners over the Texas Motor Speedway, a few helicopters, and headed back home. Pretty solid showing today! This entry was posted on Friday, November 6th, 2009 at 7:34 pm	and is filed under Flight. You can follow any responses to this entry through the RSS 2.0 feed. You can leave a response, or trackback from your own site.